Last month a contingent of friends came to visit from London and we all travelled south to Karnataka for what turned out to be an amazing two weeks of history, unfamiliar flavours, new friends and good times. For part of the trip we stayed in a homestay on a coffee plantation in hilly Kodagu (a.k.a. Coorg when under British rule, and also the Scotland of India despite the heat!) in the Western Ghats where we were spoiled with delicious home cooked Kodava food. Kodava food tends to be pretty meat and fish heavy, which is probably due to the fact that the Kodava people were traditionally warriors and agriculturalists. Curry made from tinned fish? Yes, it sounds weird I know, but don’t dismiss it too quickly. It’s so full of flavour and has an almost umami vibe that it easily makes it one of my top comfort dishes. I wonder how Goans – or any Indian for that matter – made their masala pastes so smooth before the invention of food processors? No doubt they used a pestle and mortar, but I’m betting they never got it as smooth as they do nowadays. Those dry chillies are a nightmare to grind to a paste by hand, believe me I’ve tried. The reason for my ire? I’ve been trying out various recipes for Goan fish curries and have found that my ancient food processor is no longer up to the job of anything much. That’s not to say I haven’t been able to produce a masala. Just that after half an hour of whizzing around in the processor it doesn’t go beyond finely ground. But that’s not going to stop me from posting this recipe. It’s too good not to and I don’t want you to miss out on the tanginess and spiciness of a traditional Goan fish curry. 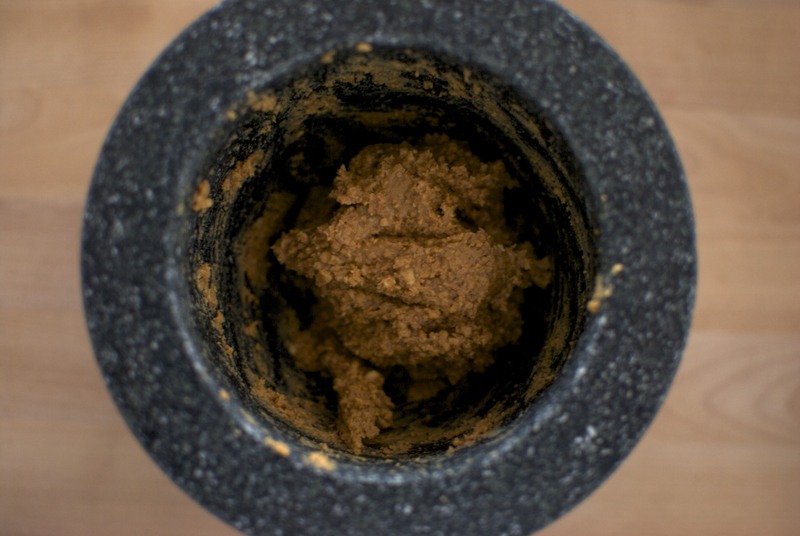 Just try to make your masala paste smoother than mine! Last weekend, exactly four months to the day we left London our things finally arrived in Mumbai. The week has been busy with unpacking boxes, putting beds together, cleaning and throwing away/donating many items – four months without your belongings will make most people realise they have more than they need! Until the outbreak of Ebola in West Africa earlier this year, my sister had been living and working in Freetown, Sierra Leone. The situation meant it was not possible for her to remain there and she was fortunate enough to be able to come home.